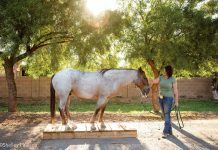 Improve your horse’s stability and balance with these coordinated movements. A horse’s ability to cover ground with big, powerful trot strides comes from stability in his pelvis and hips. When he is weak or wobbly in the muscles and connections around his hip joint and croup, he can’t adequately balance the flexion and extension of each hind leg within each stride. This wobbliness often transmits to the rest of the body. Creating stability in the pelvis and hips is not always as straightforward as it seems. As with humans, it’s usually best accomplished by using varying planes of movement with small, controlled leg placements. These kinds of coordinated movements significantly help improve a horse’s balance for lateral movements like shoulder-in and haunches-in, in addition to strengthening the trot extensions. 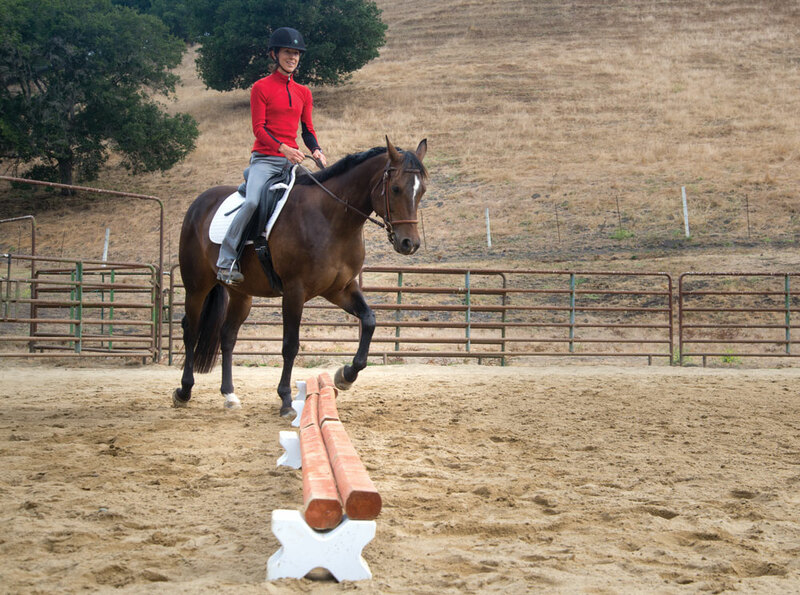 I use the Snake Over Poles exercise to improve stability, and I like it best in the very beginning of a ride before a horse is warmed up. This provides the greatest challenge to the horse’s coordination and finely controlled motor patterns. If you lack blocks or risers to raise poles up as described in the exercise, you can still practice with the poles just lying on the ground. It’s best performed at the walk only. Set up several ground poles touching end to end in a single straight line. If you have 6-inch risers available, raise the entire line of poles off the ground. Now walk a very tight serpentine that crosses back and forth over the poles from one end to the other. You should be crossing the pole every time at an oblique angle, not straight over. Keep your loops as close as possible to the pole; the purpose is for your horse to make quick adjustments. Do not stray far away from the pole. Be absolutely certain to change the horse’s bend and curvature with each loop. Repeat the serpentine several times. You can do this exercise either from the saddle or by leading or ground-driving. As long as the horse is moving steadily, changing the bend through his body in every turn, and stepping across the pole, he is gaining the benefit. After performing the previous exercise for a week or two, many horses are ready for an advanced version. To the Snake Over Poles set-up, add a second row of poles to double the width. Raise this row to the same height as described above. Ride or lead your horse in a tight serpentine, crossing back and forth across this double-wide line of poles. Aim to keep the horse’s neck low and reaching forward. 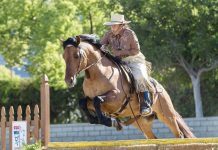 If the horse repeatedly hits the poles, leave the serpentine for a period and go elsewhere in the arena in a brisk trot to activate his energy and legs before returning to the pattern. Since doubling the width requires so many poles, you can often be creative with other materials if you don’t have a lot of poles. Some barns have railroad ties lying around, which are an adequate height to step over in addition to being wide enough to mimic this exercise. Or you can try using planks or boards to set up this pattern, so long as the edges are smooth and won’t scrape the horse’s legs. This article originally appeared in the August 2018 issue of Horse Illustrated magazine. Click here to subscribe!